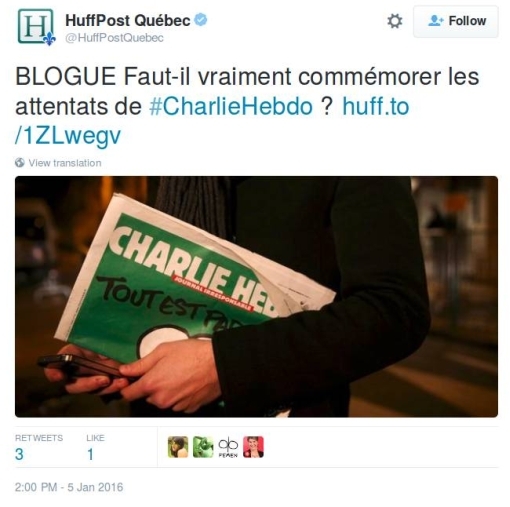 EuroSavant » Just *Forget* Charlie Hebdo! WHY oh WHY do we have to look to Quebec for a little bit of contemporary wisdom? Translated: Is it really necessary to commemorate the Charlie Hebdo attacks, as it seems France is doing all this week? In fact, the writer here, Nathalie Goulet, is from France, she is a member of the French Senate for the center-right party UDI and Vice-President of a government commission investigating how best to fight jihadist networks. These Charlie Hebdo anniversary ceremonies, she makes clear, are not the way to carry that fight forward. What are terrorists looking to achieve, after all? What might those key elements be that transform them from angry young men thinking of causing mayhem to gun-toters ready to carry that out?
. . . what these murderers are looking for, other than to promote a violent ideology and to oppose our values, is a moment of glory: they are searching for acknowledgement from their mentors, from their friends and those helots [low-lifes] who surround them. It’s inexhaustible media coverage and especially official ceremonial attention – repeating year after year – which gives them exactly what they want, and thereby also attracts future candidate-terrorists looking for their own chance to go down in a blaze of glory. Within this international bond of terrorist crimes, what sort of effects can these images of the Charlie anniversary have, other than to reinforce their conviction that they have attained their aim? To cast families into endless mourning, create a security psychosis, divide society, make more fragile the [French] Republic which then forgets here and there its founding principles of Liberté Egalité Fraternité . . . In short, we also need rather less of these ceremonies because, through craven government cynicism as abetted public ignorance, they run too much danger of becoming gigantic exercises in hypocrisy. By the way, if the French government still wants to indulge in such ceremonies, could it at least get the spelling of the victims’ names on the plaque correct? UPDATE: Here’s what I mean about the sheer “Je Suis Charlie” hypocrisy, from Glenn Greenwald: France Spends Last Year Crushing Free Speech. In all the many years I’ve worked in defense of free speech, I’ve never seen the principle so blatantly exploited for other ends by people who plainly don’t believe in it as was true of the Hebdo killings. It was as transparent as it was dishonest.